It's that lovely time of year again, when the days are longer, the snow has disappeared, and the birds are singing – yes, it's spring! That means it's time for a good spring cleaning, whether that's your home, your car, or even your IDA member profile. As detailers are well aware, after a long, brutal winter, customers are finally back in full force, ready for a comprehensive auto detailing (or maybe even boat detailing in some parts of the country). 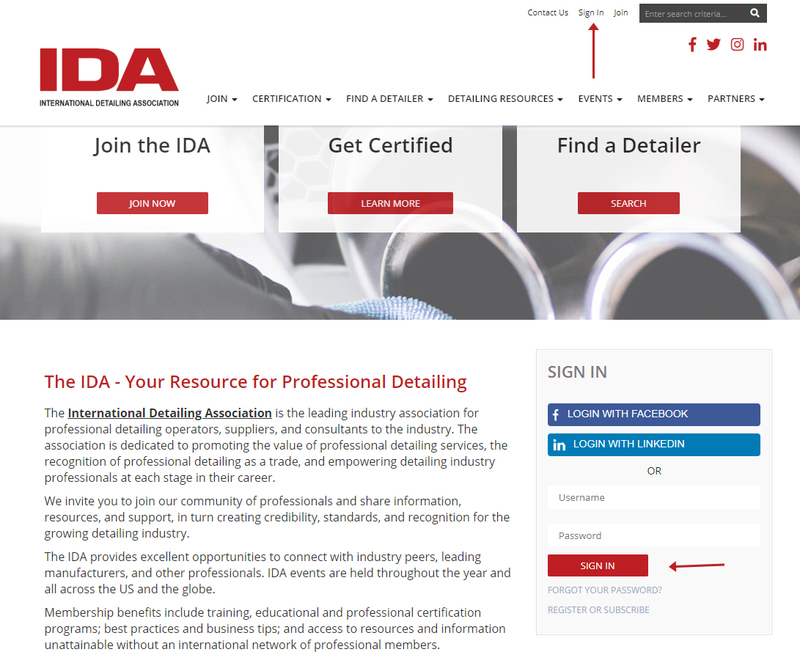 These customers are looking for your services and may end up on the IDA website, browsing through the member, Certified Detailers, and Skills Validated directories. You want to be sure to appear your best when they come across your profile. First, log in to your profile and make sure it's active! Use one of the two areas noted above to login to your member profile. If you don't remember your username or password, use the "Forgot Your Password" link or contact the IDA Central Office for a reset. Once you're logged in, navigate to "My Profile". This is the second link from the left in the top menu bar. You will then be directed to your profile page, which is how your profile appears to other members who are logged in to the website. Next, you should update your profile photo if you do not currently have one posted. Click "Edit" in the profile photo area. You will be prompted to upload a photo from your computer or device. Be sure to choose a current, professional photo that presents you and your company in your best light. A professional head shot or your logo are a few good examples. Tip: To ensure successful upload, photo files must be in JPG, GIF, or PNG format. Additionally the photos must be in standard RGB Color (CMYK photos are not web compliant and are not an acceptable color format). No uploads larger than 30MB are allowed. Once you're happy with your photo, it's time to move on to your profile. Access the "Edit Profile" section by clicking on the "About" tab, shown above. Once you're on your profile page, you will see a green progress bar with your "Profile Completeness" score. Obviously, the higher it is, the better! Click the "Increase your score today" link to edit your profile details and get to 100%! On the "About" page, update as many details as you can to make it easy for members and customers to find you and contact you. Email address: Make sure this is current, accessible, and professional. If a customer reaches out to you via email, you want to be sure it gets to the right place! This is also where all your notifications from the IDA website will be directed. Phone number: Yes, even with email, websites, and social media abounding, many people still will reach out to you via phone! Be sure that your number is updated and formatted correctly (including international code [if applicable] and area code) so that potential customers can get in touch. Website: Let people know where else they can find you online and learn more about your services. Be sure to include http:// or https:// at the beginning of the URL. Professional Address: Again, people want to be able to find your business! Make sure this field is filled out accurately, as this also determines how you appear in our directory and on our maps. Specialties and Other Specialties: If you specialize in a particular type of service, choose from our pre-selected list, or type in your own specialties. Filling out this section will help distinguish you from other members, who may not have the same knowledge or skills in these areas. Locations: This will help potential customers know if you provide services beyond the area listed in your "address" field. Education/Experience: If you've got it, flaunt it! Show off your background, skills, and specialties so potential customers can learn more about who they'll be working with. Knowing that they've got a capable, competent detailing professional on their side will make them more likely to choose your services. Social/Volunteer Organizations: If you are involved with your community beyond your business, tell us about it in this section. This will show to others that you are dedicated not only to your business, but to helping your community thrive as well. Don't forget to save your changes! Then, watch your score – and business – skyrocket this spring and beyond!